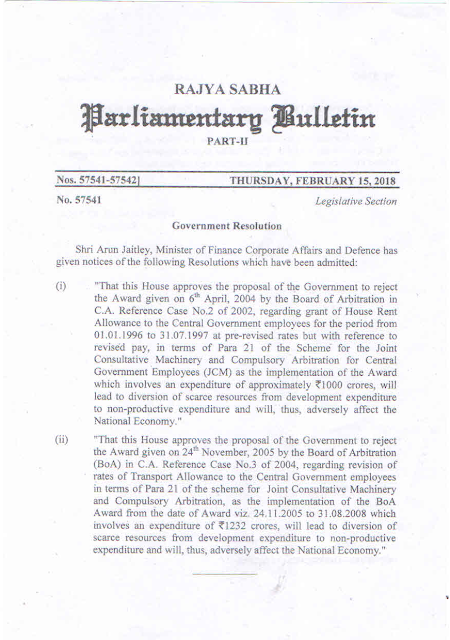 On 15.02.2018, Finance Minister, Sri Arun Jaitley has moved following resolutions in the Parliament to reject the two ARBITRATION AWARDS which are in favour of Central Govt Employees. (1) Grant of HRA for the period from 01.01.1996 to 31.07.1997 based on revised pay. (2) Revision of rates of Transport Allowance.